Or, in this case, magnetblogging about Tweeting...again. I decided a while ago that, despite my earlier hate-on for Twitter, (and you know this if you're following me) that I was just gonna Tweet when I feel like it. Unfortunately for you guys...it's a lot. But it's fun telling and Twitpic'ing people where I am, what I'm doing, where I'm headed, what I'm thinking, what I'm watching. If you want to know, great, if you don't, unfollow or hide me. Speaking of news...my breaking news also comes via Twitter/TweetDeck lately - sometimes for the good, sometimes for the bad (see my incredibly erroneous and shameful RT of someone reporting on the demise of a very much alive Morgan Freeman - won't do that again!). Earthquake in Cali? Got it. Snow days in NC? Got it. David Tennant & Catherine Tate in Much Ado About Nothing? Got it. And every time (well, maybe not for that Much Ado thing), you can almost count the minutes going by before it makes it to CNN on TV. It's nuts. Oh. That Much Ado announcement? Totally bought my tickets within hours. Someone once called me the busiest unemployed person they know...mostly because even though I've lived in NYC since 1995, there's still stuff to do here. And it just so happens that a lot of the activities added to my calendar are taken directly from Twitter. Does it seem like Twitter's too much to deal with? Yeah, it is. 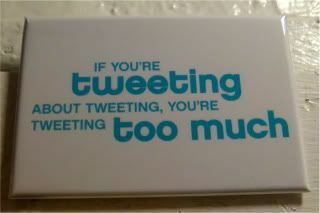 And frankly speaking, even when I'm employed, I'll always have time for Tweeting. It's 140 characters, who doesn't have time for that? I'll allow that keeping up with all the folks I follow is a bit of a pain, but that's where handy-dandy TweetDeck comes in. I use TD because it's allowed me to find, follow and connect with fun random new people all over the world. The lists columns help me follow my favorite actors and TV critics. The cool search function also lets me follow hashtagged threads of certain shows (Hawaii Five-O, Downton Abbey) and events (SDCC, Much Ado, TCA)...which in turn helps me find and follow random new people who have common interests. For example, last night's #downtonPBS thread was insane. The TweetDeck pop-up box should have just stayed up, because within seconds of Laura Linney's intro, 400 hashtagged Tweets popped up...and still hasn't stopped popping, even though the episode ended last night at 10:30. While I was able to find new people with interesting things to say, the obvious downside of the incessant chatter, is that I was too busy giggling at what people had to say about the show, rather than actually watching the show. That's a slight problem, of course. I know. I've come a long way from hating Twitter. And it's true that I have a lot of friends who are already bored to death with Twitter. I mean, it's been around for a while, and for some, it's a little past the peak. But, for now, it's a fun diversion and useful tool. It's supposedly still in beta, according to their site, and they haven't yet solved the "Twitter influence" (Twinfluence?) question, but this tool helps gauge your own activity for better or worse. Of course, I'm sure they're pointing and larfing at how often I check my own TweetLevel (it's a bit like ego surfing, it is), but it really is interesting to see how the numbers fluctuate based on your Twitter activity. Goodness. Let us hope they don't create one for Facebook.